how about integrating it into the default search? then we could use sublimes text highlighting and minimap to quickly find the html affected by the selector. That would be great to debug some of the rather tricky CSS selectors. The next step then would be to navigate from a selector in the CSS file to it’s corresponding HTML files (kinda like resharper). Hi Sven, I don’t know about integrating with the default search but I certainly agree that it would be nice to have the matching HTML elements highlighted. The problem I need to solve is how to map a DOM element to a line number in the source code, and that’s not as easy as it sounds. Great tool which i ever dreamed. Great, but it unfortunately doesn’t work on my computer. 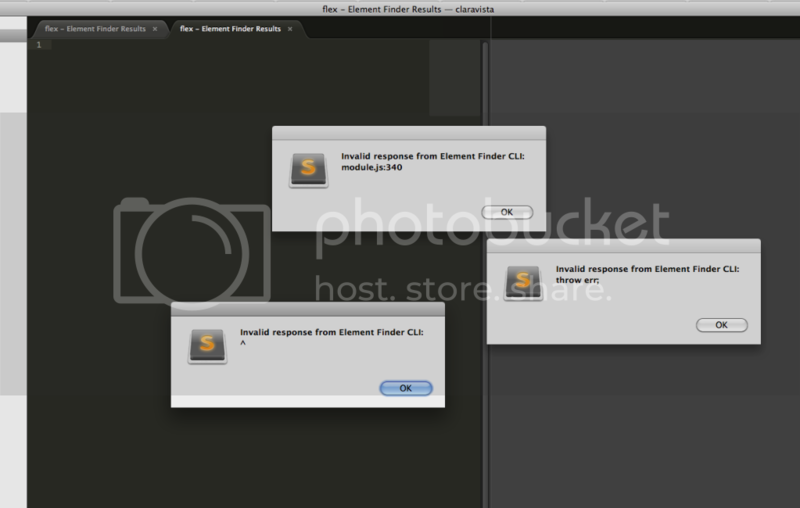 Whenever I right-click on a folder, select “Find Elements in Folder” and than paste the selector, I get an error message like “Invalid response from Element Finder CLI: Could not be found”, no matter what I enter. Hi Christian, this error is due to NodeJS not being installed. Sorry I really should have made it clear in the blog post that NodeJS is required. I have updated it now. You can install NodeJS from http://nodejs.org. It sounds like I will also need to improve the error message that appears when NodeJS is missing. P.S. if you have to edit the Element Finder settings, make sure you use normal quotation marks. In my previous comment WordPress converted them to curly quotes. Thanks for replying. I checked and the path is correct. Maybe I installed the package under the wrong directory, which is odd because I have installed others on the same directory. Hey Marco, I have removed some dependencies from Element Finder which simplify it quite a bit. Can you please try again because this may have resolved the problem for you. Looks promising! However, looks like searching php files isn’t supported? Really awesome Sublime Text package and it’s working great with real html files. Only when I am working on projects I use a lot of .shtml files before it goes to the backend development. I tried to add shtml to the settings file and searching works great but when clicking on the page link it crashes. Is there a way to get this working because this package is a real timesaver. It looks great, but I have got a jsdom error. Hey Chen, could you please tell me which version of Windows you are using and which version of NodeJS? You can find the Node version with `node -v`. Hey Chen, the JSDOM dependency has been removed so hopefully this will work for you now! Wow, great tool! Would be fantastic if one could automatically substitute the class name in the corresponding HTML files. This seems to be a great tool, but as I only use HAML, I can’t really use it (except using wget like you describe). It would be really great, if you could support HAML too! Hey Bucco, that’s a shame. It looks like there’s an error being thrown from JSDOM – possibly this one https://github.com/tmpvar/jsdom/issues/436. I’m not sure why the error is being thrown for you sorry. Hey Bucco, the JSDOM dependency has been removed so hopefully this will work for you now! Hi Keegan, thanks for the great plugin! I’ve run into a little problem recently. I used to use Element Finder extensively on OS X. Today I switched to a Windows computer and discovered that one needs to change the node_path value to in settings in order to make EF work correctly. I use Dropbox to sync ST2 profile. How could we combine the EF settings in a platform-specific way so each OS uses the right path to Node? Hey Alexander, that’s a good idea. I’m going to add three new settings to the .sublime-settings file: “node_path_osx”, “node_path_windows” and “node_path_linux”. I will make a change to the plugin so that if these settings are present they will override the “node_path” value for that OS. Hey Alexander, I have released version 0.3.1 to address this issue. It should become available in Package Control within the hour. If your “node_path” setting is correct for Mac, you should add a “node_path_windows” setting and set it to “node” for Windows. Thank you for such a quick correction! Putting just ‘node’ value on Windows didn’t work for me, as well as setting ‘node.exe’ or full path to Node.js as ‘C:\Program Files\nodejs\node.exe’ (which leads to an error about unescaped space – but i’m unable to correct it). I tried to copy node.js program folder to the root of C: drive to workaround the problem with space, but then Element Finder is just blank without any ‘Path not found’ error. Strangely the same C:\Program Files\nodejs\node.exe worked for me in previous version. Hi Alexander, I think there was a defect present which was preventing the plugin from working on Windows. I have released version 0.3.2 which I think fixes the problem. I’ve tested this on a couple of Windows machines successfully. I used a path of “node”. Let me know how it goes. Thank you! Now it works as expected. By the way, thanks also for the wonderful Specificity calculator, we used it to teach CSS specificity to students. Hey, that’s good! Out of interest, what school is it? Is it a multimedia course? It’s an HTML/CSS/JS course at the Russia’s MSU, Faculty of journalism, with a huge focus on modern CSS. Got some other problems with EF, unfortunately. Will try to deal with them, otherwise will open an issue on GitHub so they’d be easier to tackle. This is awesome! I think this is the only ST2 package available doing that. And as someone wrote above, it would be great that it can support HAML too, since it’s a html framework largely used. I got a problem using this in Sublime text 2. Each time i’m going to search it does that in the wrong directory. As you can see below, the directory where it search it’s where the package is installed. Found 0 matches in 0 files (0.583 seconds). Hey Erwin, try right-clicking on a folder in the sidebar and choosing “Find Elements in Folder”. This way you can easily define which directory to search in. I was a little lost to figure out how it works.